In zip code 63301, which serves 24,669 customers, 10,095 are without power. In zip code 63303, which serves 17,941 customers, 8,585 are without power (one of those homes being mine). If you check the map on this page and go to "zoom in" view, my home is right around the dot after the "t" in "St. Charles". A local code breaker is getting closer to cracking Kryptos, a sculpture on the CIA grounds in Washington with an embedded code that has stumped experts for years. Two weeks ago, the Post-Dispatch featured Elonka Dunin, a St. Charles computer game company executive, about her new book of codes and puzzles. 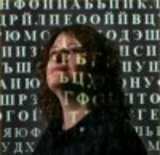 She co-moderates an online group devoted to solving Kryptos. The group has figured out three of four parts. This is an interesting milestone for me -- my name showed up in a newspaper article, without me having talked to the reporter ahead of time. Granted, it's a local St. Louis paper that is just posting an update based on recent media attention that I *do* know about, but still, it was kind of an odd feeling. Like a new "fame" stepping stone. A list of reviews of the various sushi restaurants in town, by some of the snootiest sushi snobs I've ever met in my entire life. They'll mark a place down just because the soy sauce dishes aren't in the right shape. ;) They also regard any restaurant outside of the immediate metro St. Louis area as being in a "cultural wasteland". On the plus side, this site has the most comprehensive list of sushi restaurants in St. Louis that I've found. I've sent in a few dissenting reviews, since I'm a bit more forgiving on some things (like I'm more interested in the quality of the sushi, as relative to price, and decor isn't as big a deal). Then again, I'm out in "cultural wasteland" territory, so what do I know? ;) We'll see if they post my opinions. If not, I may just have to make my own website . . .
A list of the propositions and candidates in today's (very local) election. St. Charles County, Missouri. Good resource for St. Louis jobhunters.